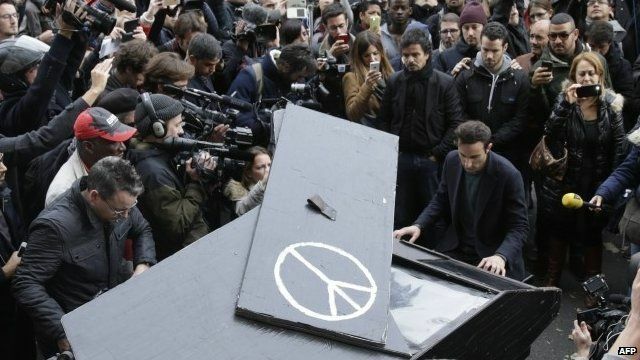 Pianist plays Imagine near Bataclan Jump to media player Pianist Davide Martello performs John Lennon's Imagine near the Bataclan theatre where at least 89 people died on Friday. What we know about Paris attacks Jump to media player At least 129 people are now known to have died in Friday's terror attacks in the French capital Paris. How IS is spreading terror worldwide Jump to media player Over recent months Islamic State targets have been under heavy attack in Syria and Iraq, but the militants have also been retaliating in the Middle East. Attacks 'an act of war', says Hollande Jump to media player Friday night's attacks in Paris were an act of war by Islamic State, President Francois Hollande says. Woman clung to window ledge to escape Jump to media player Mobile phone footage has emerged showing desperate attempts to escape the Bataclan concert hall in Paris, where at least 80 people were killed by gunmen. How the attacks in Paris unfolded Jump to media player How the the events in Paris unfolded on Friday evening. Near-simultaneous attacks killed at least 128 people in the French capital. Explosions at hall as siege ends Jump to media player A police assault ends a siege on a Paris concert hall, as some of those being held hostage inside escape. Pianist Davide Martello has performed John Lennon's Imagine near the Bataclan theatre where at least 89 people died on Friday. The Bataclan was one of several sites to be targeted by gunmen. At least 129 people have been confirmed dead so far. Writing on his Facebook page, he said: "After I saw that insane violence I just followed my heart and went to Paris with my piano."